Due to a little incident involving a horse, myself, gravity and mother earth, I recently have had quite a bit of time to go over my photo files, check out Pinterest etc. I also found a couple of blog posts in my drafts folder. Posts I had started to write but never finished. Here is one such post, now finished! In my collection of miniatures I have acquired several old pieces which, unknowingly to me at the time of their purchase, could also be found in some very famous dolls' houses. No major pieces, but such fun to discover them in these fantastic houses. You may remember my post from several years ago when I went to Denmark and went to see Titania's Palace. 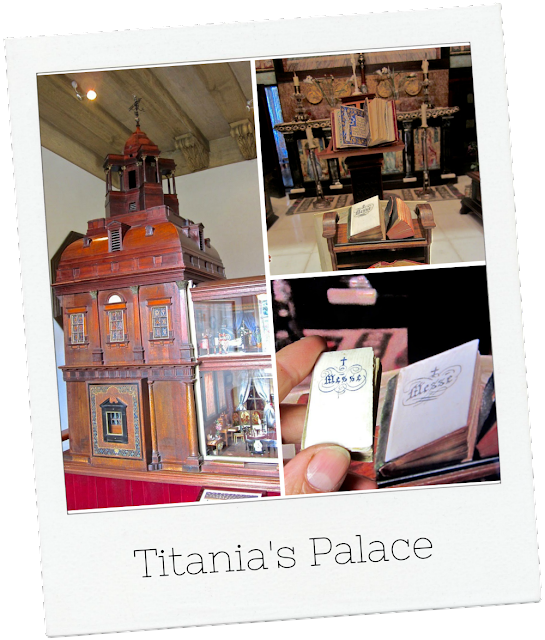 A little book in the chapel of the Palace drew my attention...I have the same little book! Mine is a bit more worn, the velvet on the spine has almost worn away and the ivory cover is a bit chipped. But it is the same little book. I found mine a few years ago at an antique market in France. 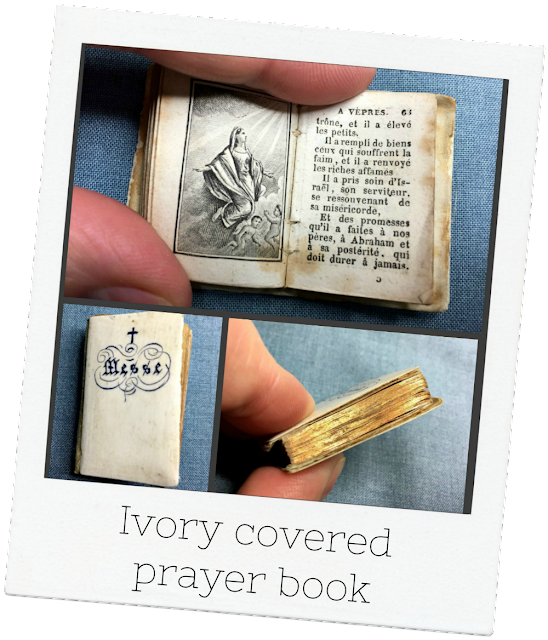 The little book with the ivory cover is a well used French prayer book: 'Petit Paroissien', which translates as Little Parishioner. It has several lovely illustrations and the pages are gilt-edged. The book is very likely 19th century (one source says it is 1839, but I think it is more third/fourth quarter of the 19th century). Published/printed by 'Paris, Marcilly, Rue St.Jacques, 10' and 'Typ. de Firmin Didot fr. rue Jacob 56'. Firmin Didot was a famous designer of type fonts for the Didot family printing shop. The Didot type font is regarded as one of the first modern type fonts. 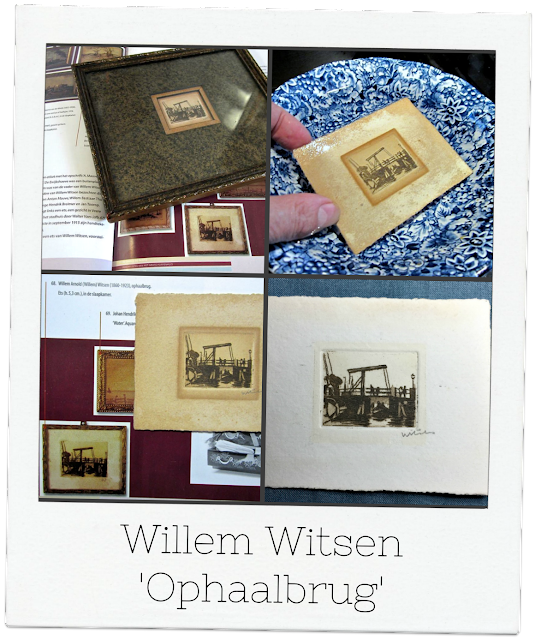 My next famous miniature is a miniature etching by Dutch artist Willem Witsen (1860-1923). Its twin hangs in the Dutch dolls' house which belonged to Dame (or Lady) Lita de Ranitz (1876-1960). The large dolls' house is a modern villa in the style which was popular around 1910. Lita de Ranitz was married to well known Dutch artist Willem Tholen and through him met many contemporary artists. 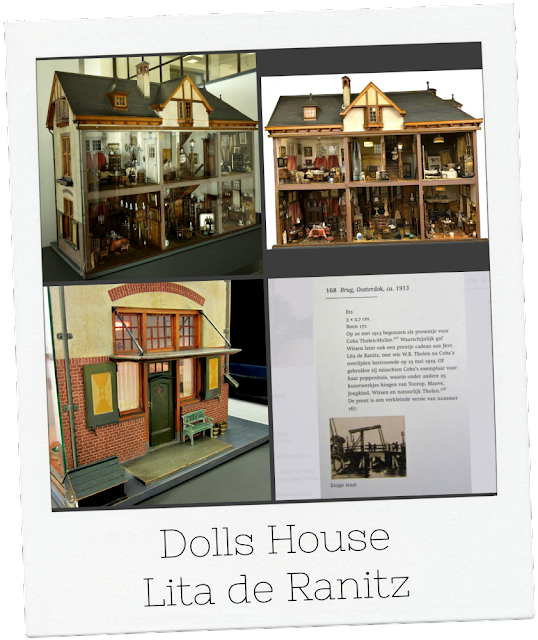 Tholen himself and many of his friends made miniature art for Lita's dolls' house. Amongst the works of art is Witsen's etching of a draw bridge (ca. 1913), signed 'Witsen' in pencil on the bottom right. The etching hangs in the bedroom, the room upstairs on the right. I was given the miniature etching as a St. Nicholas gift. It came in an old frame which was far too big for the dolls house and it was rather discoloured. After removing the ugly frame I found the etching stuck to the matting with tape. Under expert supervision I proceeded to soak the etching in lukewarm water to remove the tape. The tape came off within a minute. The water won't affect the printing ink, the signature (written in pencil) or the paper. After drying it was in pretty good condition considering it is 100 years old. It had some discolouration but that was to be expected. The next step was to bleach the print. I was so pleased it came out beautifully clean and crisp! Now here is my dilemma... the paper has not been cut since it was printed, so it still has the original edge from when the paper was made. I really don't want to cut it down, but in its original state it is rather big for the dolls house. The image itself is about 3.6 by 2.8 cm. With the paper edge it is 8.9 by 7.2 cm. It is big, but think I will have to put a frame around the etching without cutting it down. 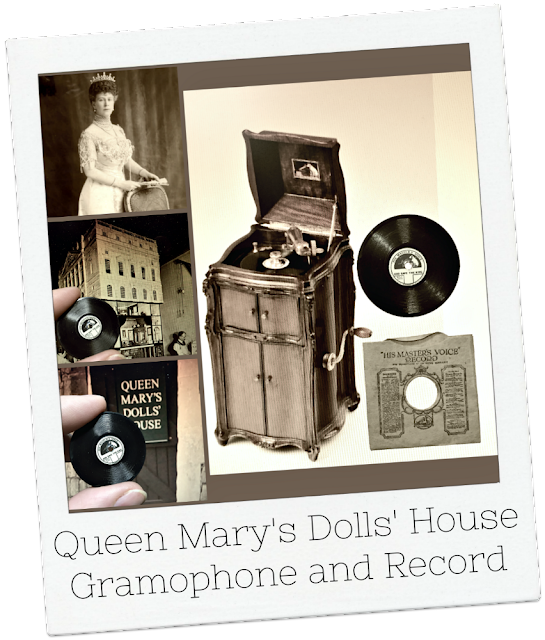 My third famous miniature is a His Master's Voice record which can also be found in Queen Mary's Dolls' House. The record was one of a set of six, commissioned by the royal household and made by The Gramophone Company in 1924. 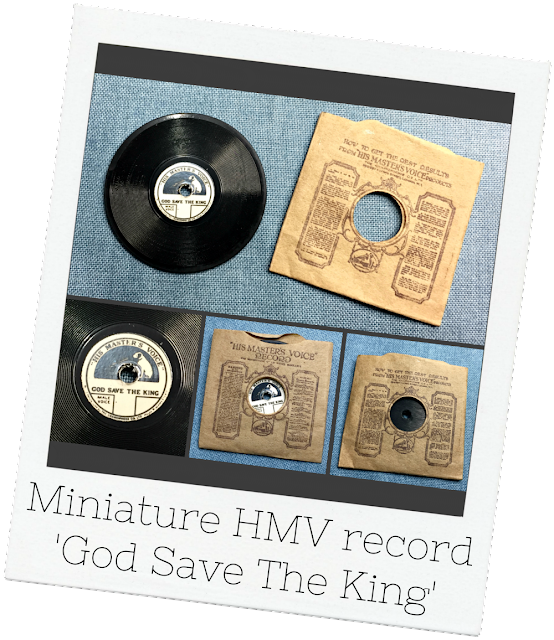 The tiny shellac record (it only measures 3.4 cm across) plays 'God save the King', sung by Peter Dawson (you can listen to a much longer version in the video below). Queen Mary's Dolls' House has a fully functioning 10 cm high miniature replica of a HMV Grand Cabinet Gramophone to play the records on. In 1924, when Queen Mary's Dolls' House was exhibited at the British Empire Exhibition in Wembley, HMV produced replicas of the miniature record "God save the King" to sell to the public. According to the Guinness Book of Records, about 35,000 of these miniature records were pressed, so my copy is by no means unique! 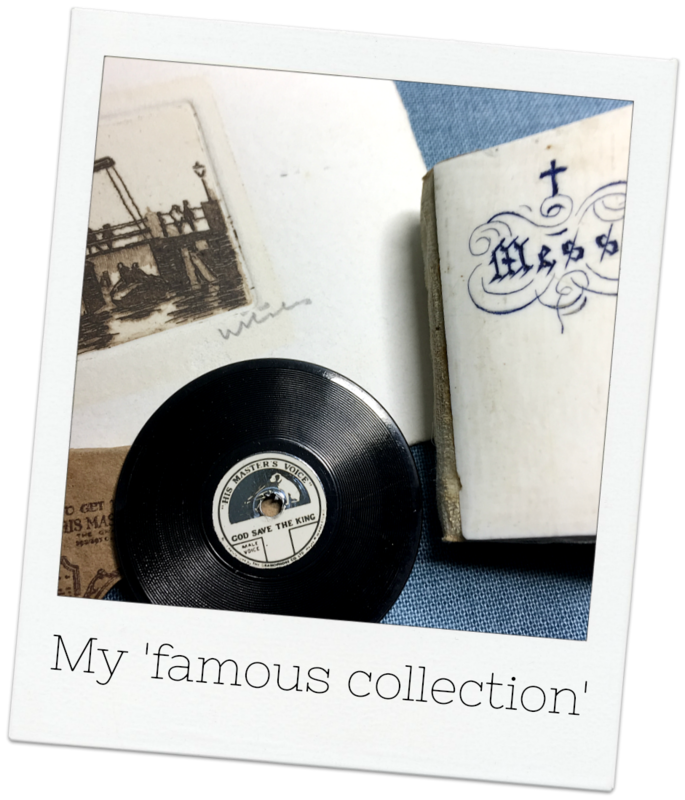 I found my miniature record in May 2011 at Chiswick Auctions in London, as part of a lot of around 20 glass topped boxes from the 1920's. Apart from the miniature disc, the boxes contained several other miniatures. Tiny knitted socks, blue glass blown vases and jars of marmelade and strawberry jam. The jam jars can also be found in Queen Mary's Dolls' House. Although I had just visited Windsor Castle and seen Queen Mary's Dolls' House the day before the auction, I had no idea the miniatures I had bought as a nice souvenir were copies of the ones in the Royal Collection. A lucky find! I hope you and the horse are all right. I'm sure gravity and Mother Earth did fine in the aftermath. They usually do. Thank you Sheila! Haha yes, gravity and Mother Earth are fine, the horse is fine, it was just I who was a bit less than fine. But I am much better now. How nice to have these wonderful miniatures in your collection. I love the ivory covered prayer book. I remember seeing the record in a post long ago. I think that is my favorite. This is the first time I think I have seen the etching. You were very brave to clean it. I would have been scared to death I would ruin it. Well done! Hi Catherine, yes I have posted about the record and the prayer book before and I thought I had posted about the etching too but couldn't find it anywhere. I would never have dared cleaning the etching if I didn't have an expert standing by me. I didn't even know you could put it into water and soak it, I thought the paper would turn into pulp again. But it doesn't, it just stays together. As for my fall, well, I wear a body protector but still managed to bruise my ribs. Very, very painful. But I am much better now! Oh dear, you too huh?!!!! I thought I knew about pain, but this was something else. Exhausting too. Hi Josje! I am sorry to hear you had a fall from a horse! I hope you are not too badly injured! (I broke my arm last spring... so I can relate!) The treasures in your collection of minis are wonderful to see! I have a very ragged "Thumbnail bible" that was printed in Boston in 1810 that has lovely engraved illustrations. It was meant to allow young children to learn the Bible stories in a small way! It is a trifle large for true dollhouse scale (being so thick)but I have treasured it for years because it was so tiny and old! Don't you wish you could actually listen to your little gramophone record?? I am amazed that you know all the history of that engraving... and can't imagine having the courage to bleach it!!! But it does look great and I hope you will show us the framed piece when it is done. Get well soon, but meanwhile keep reviewing your posts! LOL! Hi Betsy! Well I bruised my ribs, but I was told it would have been less painful had I broken them, haha! I don't intend to try it out ;-) Did you break your arm falling off a horse? Wonderful to have a piece with 200 years of history behind it. Imagine the children who owned it in all that time...And now you. I have books about the artist Willem Witsen and about Lita de Ranitz's dolls' house. I found the etching in there. Plus I have a partner who knows a lot about it. He supervised the cleaning process. I would never have dared to do that on my own. Hi Josje, Such wonderful treasures. I am so surprised you could bleach the etching paper. The result is so pristine. Also glad you chose not to cut the original paper. Hi Janine, I am recovering quite well thank you. Yes it is surprising how the bleaching affects the paper but not the ink and signature, isn't it? I wouldn't try it on your priceless Rembrandt without professional help though if I were you ;-) I had an expert to help me. But it is a very simple process with wonderful results. Hi Josje, What a wonderful post to share i thoroughly enjoyed reading it and also viewing the wonderful photos, i have to say the tiny prayer book is an absolute gem of a find.Get well soon best wishes Tony. Thank you Tony. Finding that prayer book at that French antiques market was wonderful and then to find its twin in Titania's Palace was another wonderful find. Hello Josje, these are real treasures, and they all have a very interesting story! You did a fantastic job on the etching, it looks wonderful. All great finds/gifts, thank you for sharing :-). I forgot! I hope you aren't injured too much, or break anything. Get well soon! Wow I would not have tried to clean the etching, too scary! I also would not cut it. You can just keep is as a collectible and not put it in the house. The record is my favorite. This is quite a collection and so fun to get back to it. My partner had the brilliant idea to put up a false wall and hide part of the paper behind the wall, leaving a square open where the actual etching is (or just a little bigger) and frame it. I think that is very clever. Now I just have to figure out where I can do that. I now the excitement of going through someone else's collection and being able to say, Snap! I have had a few rare moments like that too. I love your little treasures! And I hope that you and the horse are both OK. It always seems to me that the horse is ten times taller when you are sitting on it, than when standing next to it! Thank you Megan. Yes we're both OK. The horse was just surprised it lost its rider and I, well it takes some time but will be good as new soon. Laws of Physics Megan: H > (R+F²) (where H is horse, R is Rider and F is fear) LOL! Que de beaux objets! La restauration de la gravure est une réussite. Comme vous, je n'oserais pas couper le papier. C'est très excitant de savoir que des copies de vos objets se trouvent dans de prestigieuses maisons. Wat een prachtige en zeer exclusieve miniaturen collectie, Josje, die moet je koesteren!!! En oh, wat een pech om zo ten val te komen: gekneusde ribben, ja, zéééér pijnlijk! Pas goed op jezelf, neem je rust en tijd om het te laten helen. Dat zal dus geen DHN-show worden in Arnhem voor jou, hè ;)?! Dus hopelijk tot volgende week. I hope you are doing better and were not hurt too badly. Take care of yourself! These miniatures are just beautiful. you truly have a collection worthy of royalty. Ik hoop dat de val niet ernstig was. Wat de ets betreft, het bijsnijden van de randen is geen halszaak en heeft normaliter geen effect op de waarde van het kunstwerk zolang de ets en de handtekening onaangetast blijven. Zou je, als je hem niet wilt bijsnijden, niet achter een voorzetwandje kunnen plaatsen waarin een lijstje is verwerkt zodat de ets precies achter de opening van de lijst past? dan hoef je hem niet bij te snijden. Nou Huibrecht, als ik niet beter wist zou ik denken dat je hier achter de deur had staan luisteren naar een gesprek over het etsje tussen mijn man en mij. Exact de woorden van mijn man. Grappig. Wat mooi dat je nog weet dat Titania's Palace zo'n indruk gemaakt heeft op jonge leeftijd. En dat wij daar nu van kunnen genieten door jouw bouwproces te volgen! What a gorgeous collection. I hope you are feeling better and healing well.